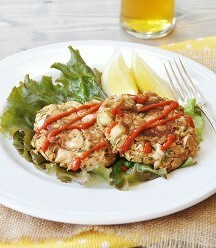 Vegan “Crab” Cakes Made with Jackfruit! They’re so close to the real thing and they’re easy to make! You know you’ve hit a home run when you have to protect your food from a pack of hungry men and two little dogs. I made the mistake of letting my son taste one of the vegan jackfruit “crab” cakes that I made yesterday, before I photographed them. Big mistake. You see, I already knew that I had created a winner, because I was having my own issues with willpower. Those little golden brown cakes had a slightly crunchy outer layer and were perfectly moist and meaty on the inside, just like the crab cakes that I remember eating before going vegan. I could have eaten every one of them, but I didn’t, I dug deep and found the strength to share. You guys, these tasted like the real deal. The medley of Old Bay seasoning, garlic, chives, and cilantro was so simple, and so perfect. Just ask my son and my husband. They were skeptical when I told them what I was making, but the proof was in the pudding—so they say—and after one bite of a vegan jackfruit “crab” cake, I had to ward them off from the platter of crab cakes by threatening them that I’d never make these again if they touched them. It worked, but they lurked, and made my work difficult. 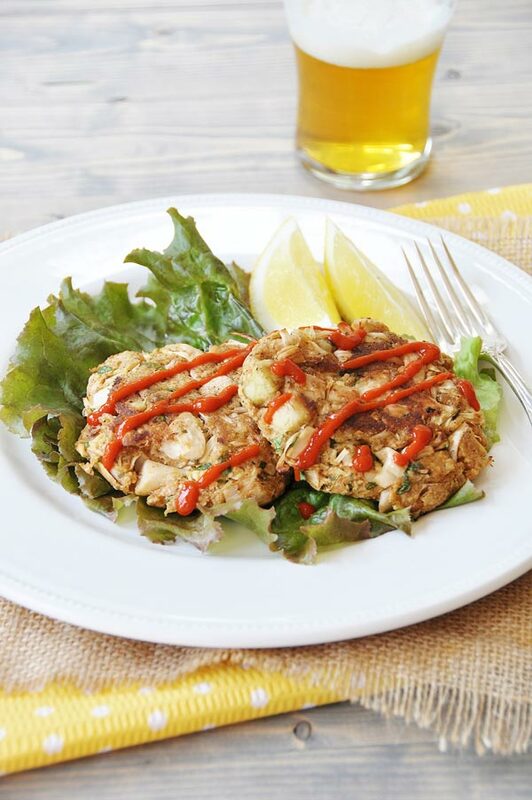 It’s really easy to make vegan crab cakes with jackfruit. 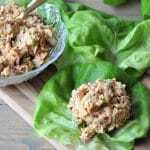 All you need to do is open two cans of jackfruit (in water, not brine), drain, rinse, pat dry, and chop until it resembles lump crab meat. You could put it in a food processor if you prefer shredded crab cakes. Once that’s out of the way you’ll want to make two flax eggs, and combine the seasonings in a large bowl. Then add the jackfruit, flax eggs, bread crumbs (use gluten-free if you want), and some minced chives and cilantro. Use your hands to blend everything together. Really squeeze the ingredients together until the mixture becomes sticky and holds together. Once that happens you can start to form the cakes. If you want to make these for an entrée, make large cakes. If you want them for appetizers, make little cakes. Now, I know that a lot of people are trying to limit or cut out oil in their diets. If you’re one of those people, I didn’t forget you. I split up my cakes and made half in the oven without oil and half in a skillet with oil. There was a difference, but my son gave both versions a thumbs up. Trust me, he’s picky, so that’s as good of a review as you’re going to get. If you want to forgo the oil then just put the “crab” cakes on a cookie sheet, drizzle with lemon juice, and bake in a 375° oven for approximately 10 minutes on each side, or until they’re golden brown and firm to the touch. They’re a little drier than the pan fried version, but they’re still quite tasty, and definitely lower in calories. The pan fried version doesn’t require a lot of oil. I put a thin layer of canola oil on the bottom of an iron skillet (I totally recommend using iron) and cooked them until they were golden brown on each side. These are not deep fried, although you could use more oil if you want. But why would you want to do that? If you like aioli on crab cakes then go for it, but I live in a household where mayonnaise is considered to be the devil, so we drizzled a little sriracha on top of ours, and it complimented them perfectly. There’s nothing like a little heat, am I right? Like I said, the wolf pack was circling me while I photographed those delicious vegan jackfruit “crab” cakes, and once I turned my camera off those gorgeous cakes disappeared in a flurry of noshing and gnashing of crazed man teeth. The poor dogs where looking up just waiting for crumbs to hit the floor. It was chaos of the best kind, because I had hit it out of the park, and there’s no better feeling than that. What is Jackfruit and Why Should You Eat It? Jackfruit is a tropical fruit (related to the mulberry) found in Southeast Asia. 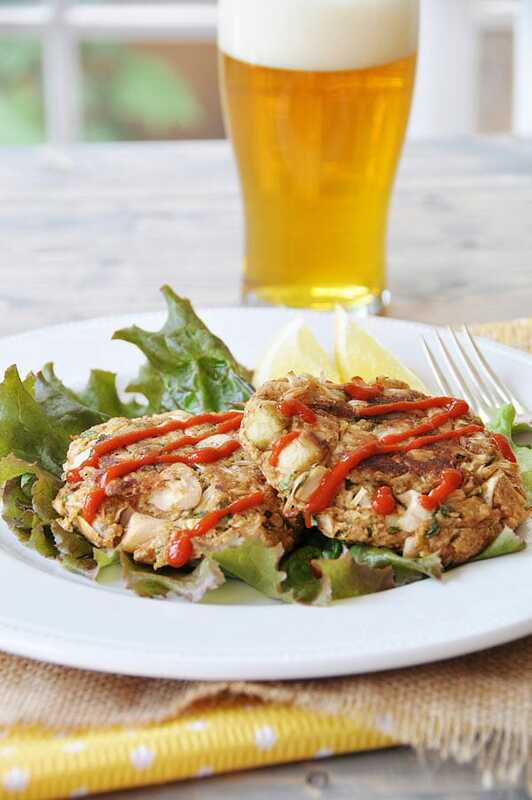 It has a mild, sweet flavor, but when packed in water, it becomes so mild that it can be transformed into “crab” cakes. 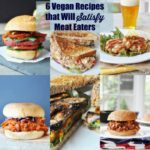 or vegan pulled BBQ. It’s a great source of fiber, potassium, vitamin B-6 and C, and magnesium. Pretty awesome, don’t you think? NOTE: Purchase jackfruit in water, NOT brine, or they’ll turn out too salty. 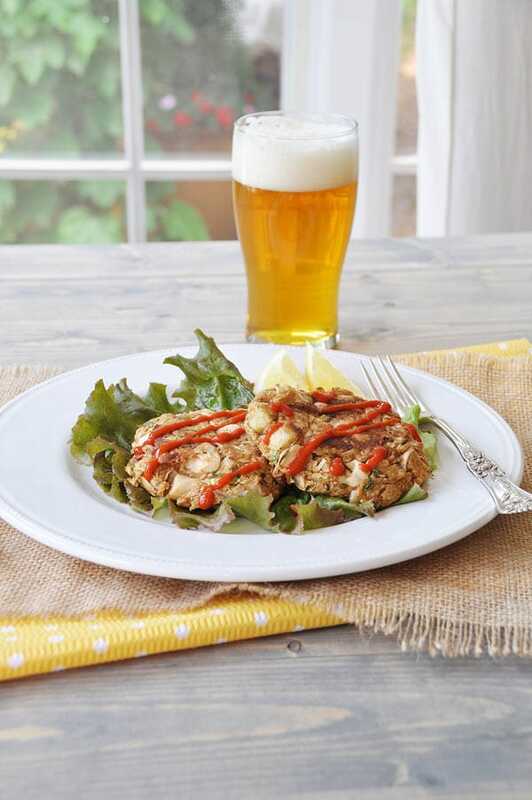 Make these delicious vegan crab cakes and take a picture and tag us @veganosity on Instagram so we can see your beautiful creation! Have you ever had crab cakes? Have you ever cooked with jackfruit? Have you ever heard of jackfruit? Some of the products that I used to make these delicious vegan jackfruit “crab” cakes: Click on the picture to purchase. Preheat the oven to 375° and put the cakes on a cookie sheet. Squeeze lemon juice over the top of the cakes and bake for approximately ten minutes or until golden brown. Flip and squeeze lemon juice on the top of the cakes and bake until golden brown and firm to the touch. Cover the bottom of a large skillet with a thin layer of oil (1 to 2 tablespoons) and heat on medium-high heat. When the oil is hot add the cakes and cook until golden brown (approximately 5 minutes). Flip and cook until golden brown and firm to the touch. I loved this recipe, but I bought jackfruit in brine not realizing it would be different, so my crabcakes turned out very salty. If you're prepping to make this recipe, make sure you get jackfruit in water! I'll use the Amazon link next time! Oh no! So sorry, Briana! I'm going to make a note in the recipe. I've only ordered jackfruit through Amazon and didn't even realize that it comes packaged in brine. I'm so excited to use this recipe! I've been trying to find a quality recipe without palm or artichoke! If someone does buy jackfruit in brine instead of water, soaking it overnight in water or for a few hours really helps pull a lot of the salt out. Hi Kim, you can use regular bread crumbs. The panko crumbs give the cakes a little extra crunch. Panko, not pandora, darn spell check. Hi, AndreaJoy! Wow! How cool, I'd love to find fresh jackfruit. From what I can see, it's much like a squash on the inside. Remove the seeds and the core and pull the meat of the fruit out and shred it. It should cook the same as the canned. Let me know how it goes. Just made this, and while it was FANTASTIC, be sure if you use jackfruit in brine that you do NOT add any additional salt, as this was our only misstep. Made an amazing condiment to add, which really added to it's depth- mixed sour cream, horseradish and a splash of sriracha. Will make again, and thank you for the recipe! Hi Tawnya! Great tip, thank you. Jackfruit packed in brine is totally different than that packed in water. I'll add that to the recipe. :) I'm so happy you enjoyed them, and I love the toppings you put on them. Would be nice to put the note about the jackfruit in water at the beginning. About to fry mine and then i see the note. Ugh!! Hi Angela, our apologies. The instructions state, "2 17-ounce cans of jackfruit in water" in the ingredients, although I agree that we should put a, "See Note" next to the jackfruit. I hope your cakes turned out. Can I make and freeze them ahead of time? I'd then thaw them in the fridge and fry them. Hi Kristi! Yes, you can freeze them for up to 3 months. Enjoy! Hi! Very excited to make this recipe. If I was to make this recipe with regular eggs instead of flax eggs, would you recommend using one egg or two? I’m not full vegan and would rather use the eggs I have on hand rather than buying flax seed. Thanks! Baked these last night. 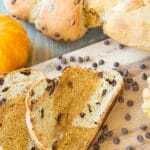 Great recipe.. Love that it's oil free. I'm throwing away all my other jackfruit crab cake recipes now. This one is the best one we've tried yet. They did take longer to bake in the oven than directed. Delicious! !